Track and waypoints in GDB and GPX format. Comment: electric shower head, Wifi, TV, drinking water, common kitchen, fridge, terrace with a view, easy to find. silent and big room. kitchen. Garage in-house. cheap. Hosts speaks English. Clean shower/toilet. had to wait for a while before I got hold of the owner but some other house guests helped. 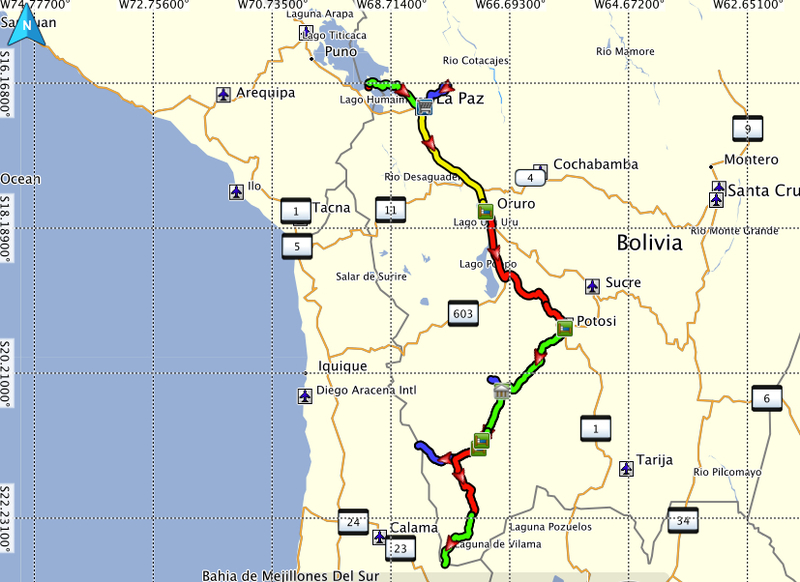 Parking costed 4USD, my dog 6USD per night which made the room a bit expensive for Bolivia but maybe not for La Paz. My room door had glass tiles and I could see when the light went on in the corridor. Slow to unusable internet. On the last night there was no toilet paper (even though toilets were cleaned) and I could not find the owner.